How did the murderer identify his victim in an almost pitch-dark alley? And why was the only potential eyewitness later killed--when that "eyewitness" was completely blind? "Close Call," (Black Mask, January 1933) the third of the Ken Corning stories, starts off with a bang and doesn't stop sprinting until the final sentence. Corning is still butting heads against the corrupt city administration and this tale opens with a dirty cop trying to badger Corning into giving away information about the lawyer's latest client. The client is accused of murdering a newspaperman who was working for reform. The accused man is also a reformer, but the cops have come up with a vague motive for the murder and have a supposed witness to the murder stashed away. Corning is not a man to be badgered or intimidated. He gives the cop a verbal beat-down and immediately starts looking for a witness of his own who can demonstrate his client's innocence. He accomplishes this without too much trouble, but the cops are right behind him and quickly start their intimidation tactics again. Corning also finds out where the prosecution witness is hidden and tries to speak with him. He's tossed out before he can do so, but he gets a look at the witness AND has arranged for a press photographer to get a picture of him (Corning) being forcibly ejected from the hotel room. The resultant publicity gives him a slight advantage. But then Corning's witness is bribed to leave town. Putting everything he learns together, Corning realizes the prosecution's fake witness is actually the real killer. He might not be able to prove this, but he can once again use the power of the press to force the D.A. to drop the charges against his client. It means pulling a stunt that requires Helen Vail, his loyal secretary, to arrange a fender bender with a cop car AND it comes uncomfortably close to suborning perjury. But if it works, an innocent man will walk out of prison. The dynamic between Corning and Vail grows even closer to the one Erle Stanley Gardner was building in his Perry Mason stories, but it's a dynamic that Gardner handles well, so there is no objection to it. The story is perhaps the fastest moving and most purely entertaining of the first three Ken Corning stories. 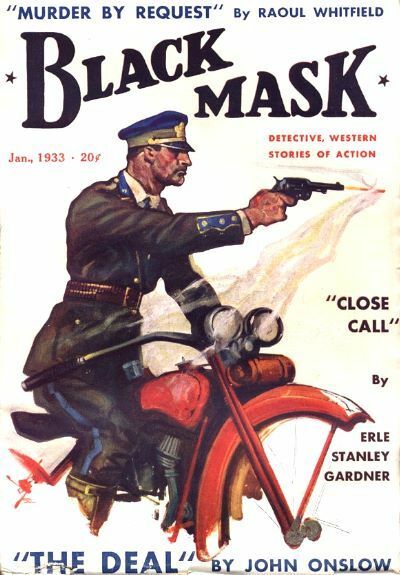 The first three stories were published in consecutive issues of Black Mask. There would be a five-month gap before the final three stories appeared, but Ken Corning will be back. There's still a lot of corruption in New York City that needs cleaning up. 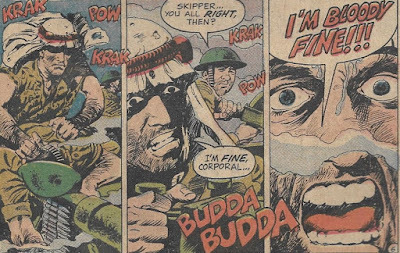 I think the short back-up features that appeared in DC's war comics during the 1970s easily rival 1950s EC in using comics to tell short but gripping stories. G.I. 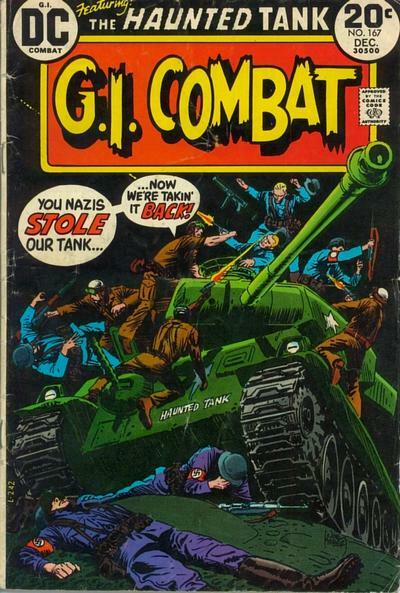 Combat #167 (December 1973) gives us a fine example of this. 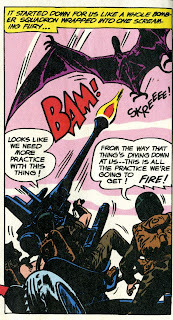 The back-up story is "Just Another Mission," written by Steve Mitchell and drawn by Ken Barr. It's about a British Long Range Desert Group team, given the job of travelling behind enemy lines just before a big push and capturing an airfield that will be needed for flying in supplies. Lt. Steed, the unit's commander, is assured that resistance will be light and that there is no enemy armor present. The story immediately earns points by featuring British soldiers, though actually DC's war books were very good overall about acknowledging the accomplishments of our Allies as well American soldiers. It earns more points when we find out the airfield is held by Italians. In World War 2 fiction, Rommel's Afrika Korps get so much attention, we forgot that Mussolini's soldiers were there first. Mitchell's concise script moves the story along quickly and Barr's art really shines when the attack on the base commences. We're able to follow the action, but Barr also infuses it with a sense of chaos and real danger. 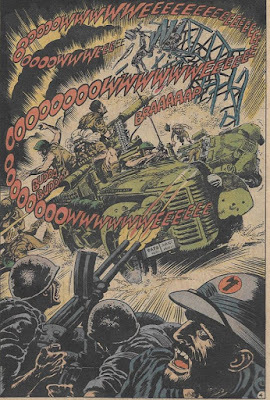 When the Italians turn out to have a tank--despite what Steed had been told--the British end up taking quite a few casualties before they take the airfield. The next day, Steed learns that it had all been for nothing. The British attack had been called off. Steed is told he might get a medal and that his lost men and equipment will be replaced, but that doesn't really help all those dead men, does it? The entire story runs just seven pages--and one page is given over to a magnificent splash panel that immediately establishes the pure terror and randomness of combat. But the story is not rushed at all. It has a coherent plot-line and a terse but effective character arc for Lt. Steed, including a few hints along the way that he's probably already been in combat far too long. And this is only one of many excellent short stories found in the back pages of G.I. Combat, Our Army at War and Our Fighting Forces. There really needs to be a trade paperback reprint featuring the best of these tales. Next week, a giant alien hand reaches through a dimensional rift and wrecks havoc in Gotham city. Some days, it doesn't pay to leave the Bat Cave. 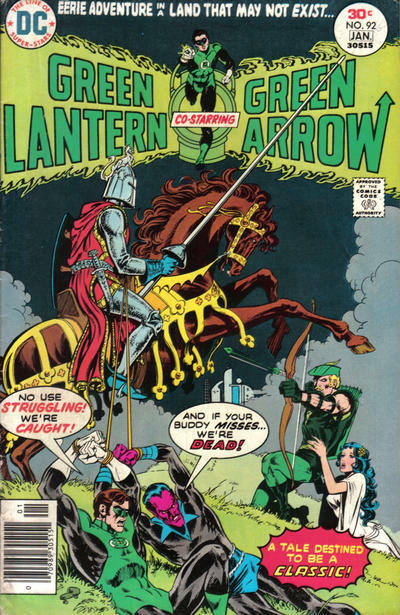 I haven't read this one, but the Mike Grell cover does its job well in making me want to read it. GL and his arch-enemy both captured by a night in armor--how the heck did that happen? The circus comes to Dodge City! You'd think this would be a good thing, but Marshall Dillon is very uhappy. 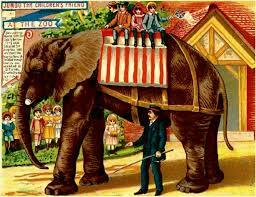 He knows the last two cities at which this particular circus played had deadly riots. It's finally over. My life-long quest--a quest for which I would have spent my fortune and gladly betrayed friends and family--has at last been fulfilled. As I mentioned a few weeks back, I have been trying to identify and re-read a particular book I originally read when I was about 11-years old. It was one of two young adult novels involving PT boats during World War II. For years, my search was confused by the fact that I didn't remember that there were indeed two different PT boat novels and I was mixing together plot points when I searched for it. But finally, I discovered one of them: Torpedo Run in Iron Bottomed Bay, by John Clagett. I'll actually be reviewing that one soon in a second "PT Boats from My Childhood" post. It was reading Clagett's book that convinced me there was a second young adult PT novel out there, containing the plot points I remembered (the first name of one of the characters and a general memory of several of the battle scenes) which weren't in the Clagett book. With a vital clue recently provided from Goodreads "What's the Name of That Book" forum, I was finally able to find the other PT boat novel. This is actually the second in a series of six books featuring young sailors Bob Dunbar and Gary Lunt, who end up serving on different types of vessels over the course of the series. The Hostile Beaches (1964), by Gordon D. Shirreffs, is further proof that I had impeccable taste in reading materials and films when I was a kid. Whether it was a TV series novelization, my first comic book, or a movie that I enjoyed as a child, when I revisit them as an adult decades later, they always turn out to be great. 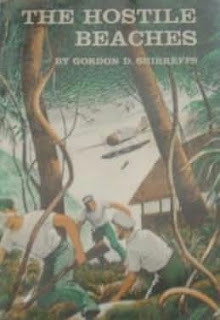 Bob and Gary start out the novel on a destroyer during the Solomon Islands campaign. After a night action, in which their ship and two other destroyers attack and sink some Japanese vessels, their ship hits a mine and also sinks. Circumstances lead to Bob and Gary being reassigned to a PT boat. Bob is a signalman, but also has a lot of experience handling small craft. Gary is known for running off at his mouth when he should shut up and does something incredibly stupid from time to time, but is one of the best Gunner's Mates in the Navy. In fact, he convinces the PT boat's commander that he's worthwhile when he uses one of the boat's twin-barreled .50 caliber machine guns to shoot down a Japanese bomber. This leads to the action scene I still remembered vividly years later. During the Solomon campaign, the Japanese would use barges to sneak reinforcements and supplies to contested islands at night. PT Boats were often assigned to "barge-bopping," which meant finding and sinking these small craft before they reached their destination. This was made dangerous by the fact that the barges were armor-plated and equipped with cannon and machine guns. So when the American boat attacks what turns out to be eight barges, they have a fight on their hands. And it is an exciting, suspenseful fight in which the PT boat takes damage and loses a man, but sinks five of the barges and drives the others into the hands of other PTs. 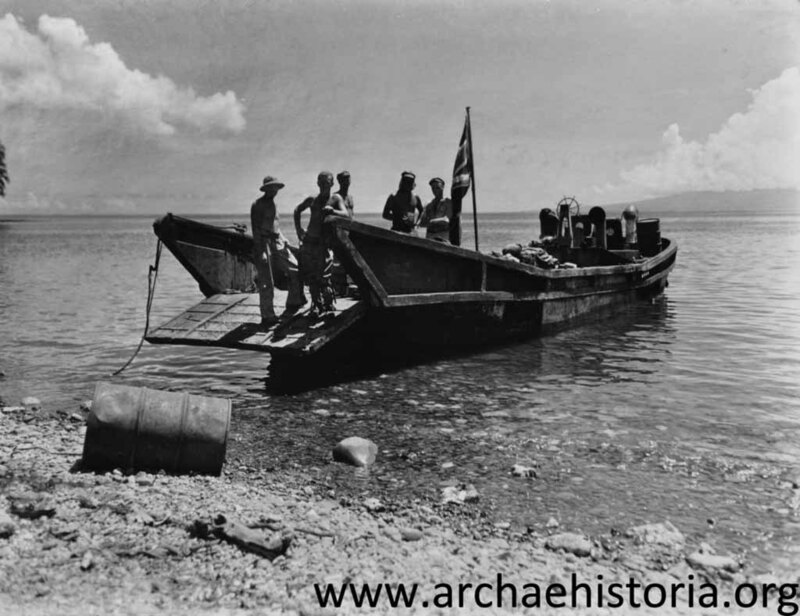 The next job involves sailing into enemy waters, hiding out in a small river on an island during the day and barely avoiding discovery by Japanese troops. They are delivering radio equipment to an Australian coast watcher, but bad luck leaves Bob and Gary stranded on the island with the coast watcher. They begin to help out, taking over the job completely when the coast watcher grows too sick from a bullet wound to keep working. And, since the Japanese are building a large base on the island, getting a steady stream of information out to the Allies is vital--even if this means dodging enemy soldiers & guard dogs, working with an unreliable radio and risking attacks by various poisonous animals that live in the thick jungle. These last few chapters are incredibly tense. The Hostile Beaches also includes technical accuracy in terms of equipment and weapons, an understanding of realistic military tactics, likable characters and just the right amount of humor seeded throughout the story to make it seem real. I really did have great taste in stuff as a kid. Shogun Warriors #15 (April 1980) is a filler issue, with Steven Grant (writer) and Mike Vosburg (artist) taking over for Doug Moench and Herb Trimpe. 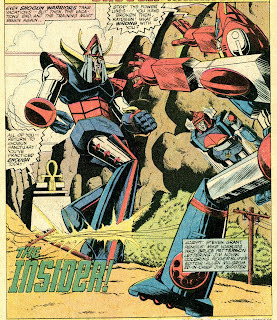 (Trimpe still did the cover.) But it's a really good filler issue, telling a truly exciting story. The Shogun pilots are all back in Japan, getting in some training together. But all three of them are awkward in their control of the robots. There's a good reason for this. Richard Carson isn't really Richard Carson. He's a member of the Yakuza--the Japanese mafia--wearing a Carson mask. The real Carson has been kidnapped. 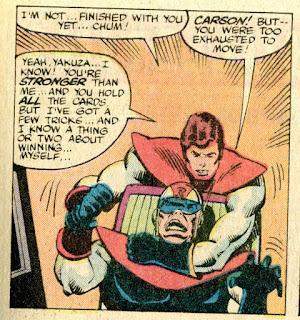 The fake Carson has been slipping neurotoxins into Savage's and Genji's food, which is making those two groggy and uncertain when they pilot their Shogun Warriors. The plan, of course, is for the Yakuza to gain control of the robots, since heavily-armed giant robots can be an enormous benefit to a criminal organization. If the local shopkeeper isn't paying his protection money, a visit from a 300-foot tall metal monster will probably get him to cooperate pretty quickly. This story, by the way, is apparently a flashback, as the next issue will pick up right after the end of the Dr. Demonicus story arc. The Yakuza plan begins to unravel when they decide to tie Carson to the seat of a car and drive the car off a cliff to crash on top of the Shogun base. Carson, remember, is a stunt driver. So, even though it means driving with his feet, he manages to steer the car away from the cliff and down a road. I really enjoy that scene. Vosberg does a great job choreographing the action and it shows Carson being clever as well as having fast reflexes. 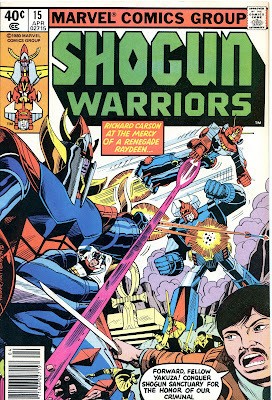 Carson's escape blows his double's cover, which leads to a straight-on fight between the robots. Unfortunately, the two good guy pilots are still groggy from the toxins they've been fed. The Yakuza begins to wipe the floor with them. But if the good guys can't win the fight on their own, they can at least distract the villain. This allows Carson to get on board Raydeen and, after getting punched around himself for a few panels, finally get the drop on the Yakuza. After that, it's pretty easy to catch the remainder of the gang. 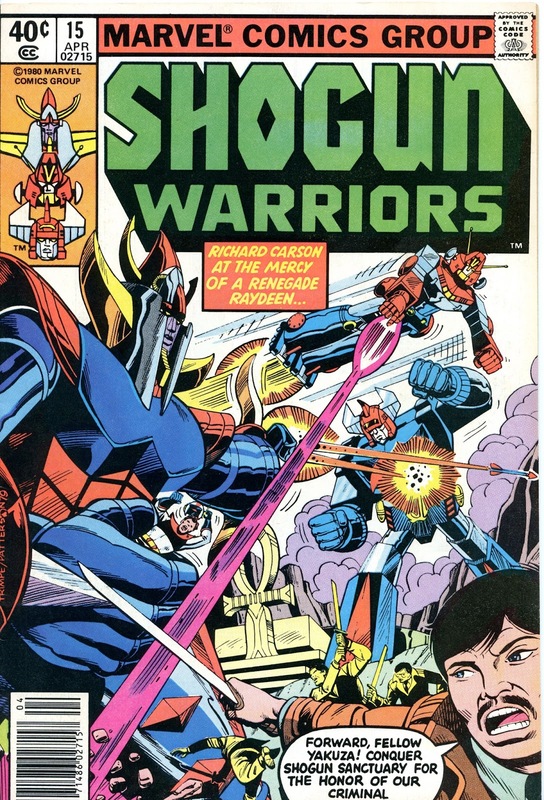 So Shogun Warriors #15 is indeed a filler issue--a break from the usual robot vs. monster stories with guest writers/artists stepping up to the plate. But it's what a filler issue should be--telling an exciting story in its own right that remains true to the characters and spirit of the book. Next week, we'll travel with British commandos through the Sahara desert. During the Silver Age, Superman's friends used to go insane with disturbing frequency. Fortunately, they usually got better. Everyone wonders why Lennie--a big, burly man--wears a locket and values it so highly. Oddly, the answer might involve outlaws who are apparently black-mailing the owner of the ranch at which Lennie works. 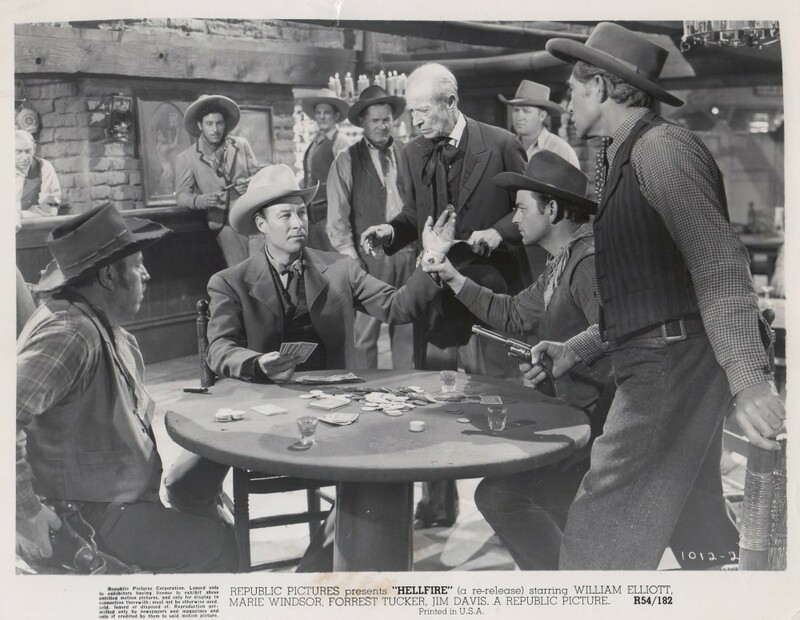 Wild Bill Elliot spent years making entertaining B-Westerns, perhaps being best remembered for playing comic strip cowboy Red Ryder in 16 films during the 1940s. 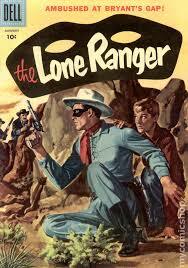 In 1949, though, he made a Western with themes and emotions that go a bit deeper than most B-Westerns usually did. In Hellfire, Elliot is caught cheating at cards in an out-of-the-way saloon and is about to be gunned down. An itinerate preacher (who had been rather unsuccessful preaching to the denizens of the saloon) intervenes. The preacher is badly wounded, but Elliot manages to get the drop on the crowd and get away with the wounded man. The preacher's wounds are fatal. To pay back the debt that he feels he owes, Zeb (Elliot's character) promises to race money for a church. He also accepts the preacher's Bible as a gift and actually starts reading it. The movie time-skips ahead to show us that Zeb has been travelling from town to town, trying to raise money for a church, but meeting mostly contempt and mockery. We see that he's trying to live up to what he reads in his new "rule book," though he occasionally struggles with his temper and in trying to decide what is the right thing to do in specific situations. For instance, when he has a chance to capture a female outlaw named Doll Brown (Marie Windsor) for the reward, he decides he can't build a church off someone else's misfortune. So he rides along with Doll, hoping to convince her to give herself up. But Doll has a mission herself--she is determined to find her long-lost sister, presuming that her sister is living the same degrading life as a dance-hall girl that Doll herself lived before she learned to use a six-shooter. Complicating this is a marshal (Forrest Tucker) who has been on Doll's trail for months and has personal reasons for finding her. The marshal is an old friend of Zeb's and turns out to have a connection with Doll's sister. Events play out in a way that leaves Zeb obligated to keep secrets about Doll from the marshal and secrets about the marshal from Doll. He watches has both walk down self-destructive paths without any apparent way for him to intervene. The movie treats the themes of faith and the power of Scriptures with complete sincerity. Elliot also gives his role sincerity and subtle emotions. Windsor and Tucker are good (Tucker is one of those actors who is always fun to watch) and the movie's climax has a lot of power to it. When time on the planet Earth starts running backwards--well, even by the standards of Superman's unusual life, that's really weird. 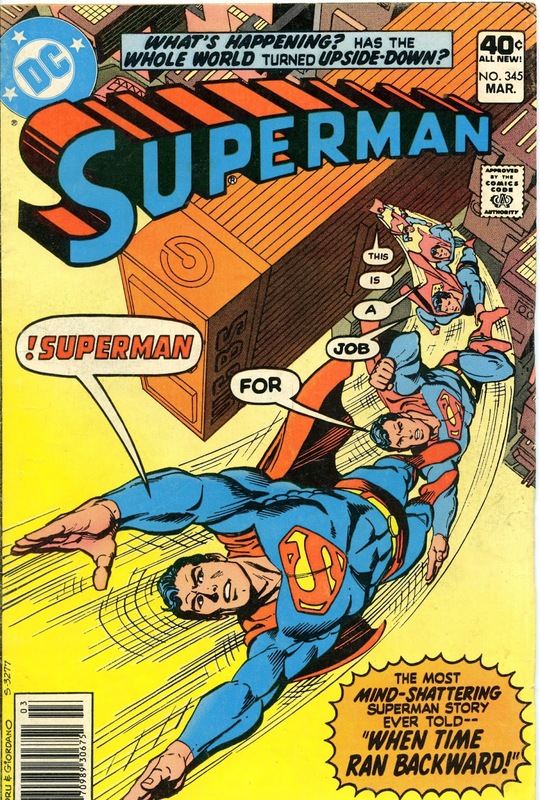 It happens in Superman #345 (March 1980) while Superman is stopping an out-of-control satellite from crashing into Earth. Suddenly, time moves backwards. 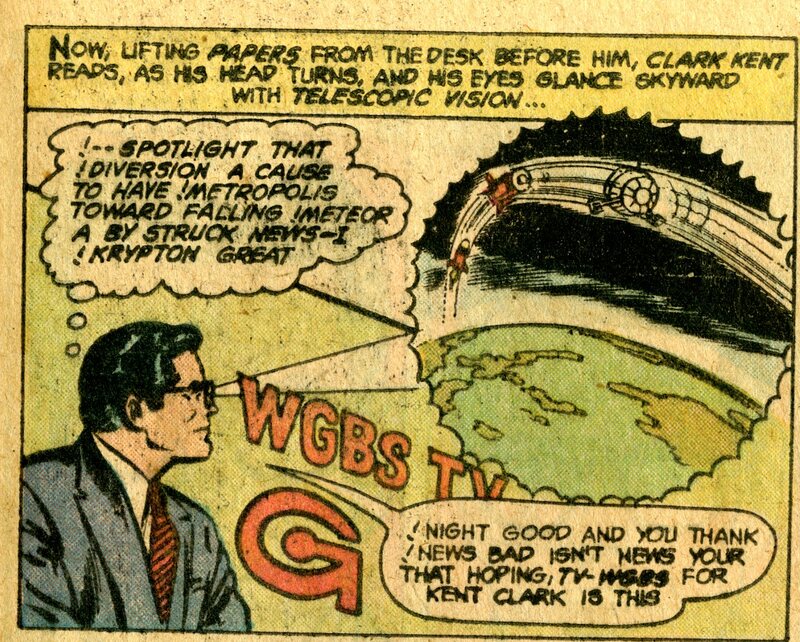 Superman un-stops the satellite and flies backwards to the WGBS building, where he (as Clark) starts reciting the news backwards. Within a few minutes (within a negative few minutes?) 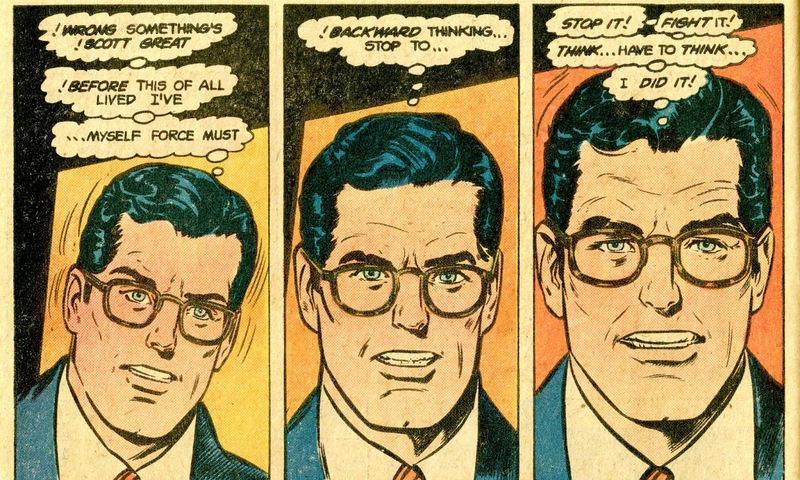 Clark realizes that something is wrong. He's able to mentally break free from the reversed flow of time, but then the rest of the world (still flowing in reverse) fades away from him. I love how Superman's ability to break free is explained. Because he's done so much time travelling over the years--especially while he was a member of the Legion of Super Heroes--he's built up an immunity to chronal disruptions. He's the only person on Earth not affected by the reverse. It's too bad a cameo by Rip Hunter couldn't have been worked in to the story, since it could be presumed he's also built up an immunity. But perhaps Rip was "currently" in the past and the time reversal just hadn't caught up to him yet. 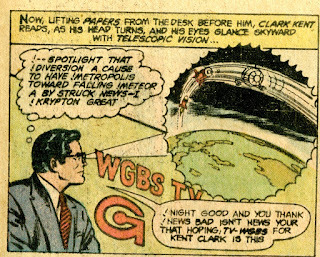 Superman chases the time stream and finds an alien ship draining Earth of its chronal energy. 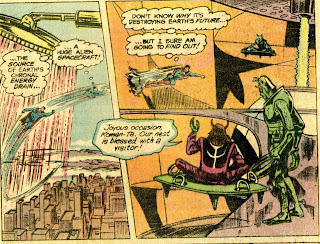 Curt Swan designs a really nifty ship here, by the way. The aliens aboard the ship are a species that travels sideways in time. After their ship was damaged in an accident, they lost most of the chronal energy they use as fuel, so they are using Earth to re-fuel. 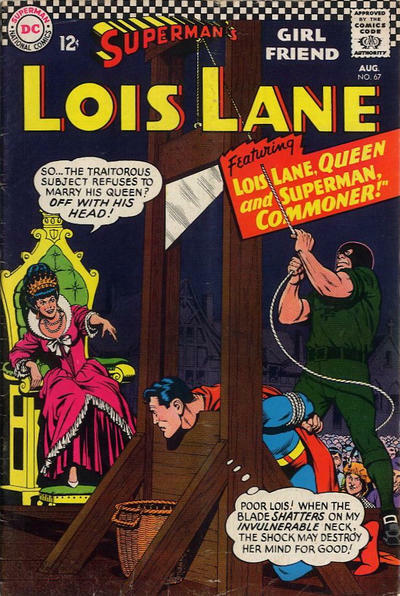 Since that means eventually wiping out humanity, Superman does object to this. 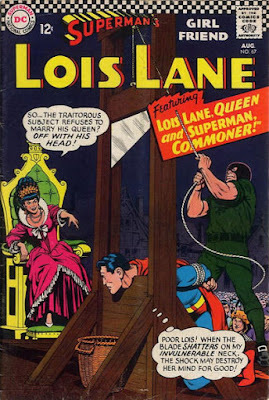 There is very briefly a moral quandary for the Man of Steel. If he stops the re-fueling, the aliens will die and he's sworn never to allow anyone to die. But he quickly spots evidence that the aliens are lying about their supposed "accident." They are actually at war with another "sideways in time" race and suffered battle damage. Superman stops the chronal drainage and, though displeased with the aliens, gives them a super-shove to send them through time back to their home. Earth reverts to normal after its chronal energy is returned. What's interesting about this story is how much information writer Gerry Conway must give us to explain what's going on. Every page or two has yet another information dump. Often, this would make a story slow-paced and perhaps even a little boring. But that's not a problem here. In addition to Curt Swan's spaceship and alien designs, the ideas behind the story are fun. There's the reason for Superman's time-travel immunity; the idea of a species that travels sideways in time rather than through space; and Superman's deductions that the aliens are (in part) lying to him. There is a lot of dialogue here to explain all this, but we have a great time reading those explanations. "When Time Ran Backward!" is a prime example of how a good science fiction or fantasy story can really touch your sense of wonder and imagination. Next week, we find out that giant robots really need to be equipped with the equivalent of a car alarm. I wanna go into space right now! 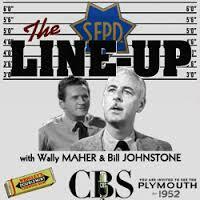 The Line Up was another of the Dragnet-inspired police procedurals that popped up on radio in the early 1950s. Like The 21st Precinct, it was able to develop its own personality and was enjoyable on its own terms. This episode involves the cops trying to run down a quartet of thieves who have been robbing stores and have killed at least one person. On the Run from the Law for... Breaking a Camera? Erle Stanley Gardner's Perry Mason novels started out very hard-boiled, with Mason pretty much acting as a private eye as he tough-guyed his way to solving murders and clearing the names of his falsely-accused clients. But, though he could always be tough, the Mason stories evolved into the excellent but more cozy murder mysteries usually climaxed by wonderful courtroom scenes. But--as we saw in our look at the first of the Ken Corning stories that appeared in Black Mask, Perry wasn't the only hard-boiled lawyer who used P.I methodology that Gardner unleashed upon the world. What sets the Corning stories apart from Mason is the theme of government corruption that drips from the pages. Corning works in New York City, which was just as corrupt in the pulp universe as it often is in real life. In his initial outing, Corning was able to foil a plot to give a civil service post to a crook and caught a murderer. But the killer was a pretty low-level thug. Political boss Carl Dwight and a corrupt cop named Perkins are still free. 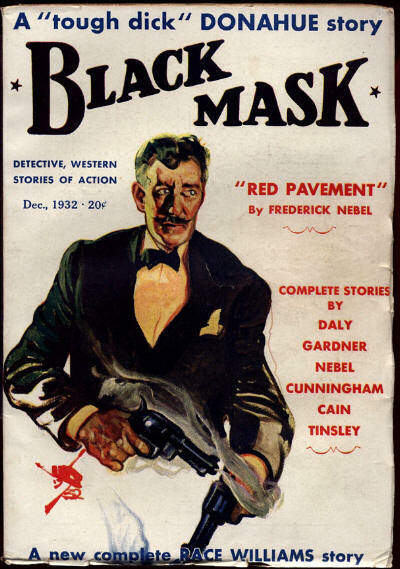 The second story is "The Top Comes Off," (December 1932 issue of Black Mask), in which Corning is hired by the wife of a man accused of murder. The odd thing about this is that the murdered man was the wife's lover. A reporter barges into Corning's office to get a picture of the wife. Corning tosses the guy out and breaks the camera. The reporter goes running to the cops. Corning, by now, realizes that an aspect of the case ties it into the city's political machine. The minor charge is trumped up and soon there's a warrant out for Corning's arrest. So he gets faithful secretary Helen Vail to stash the wife away in a hotel room under a false name. He registers at another hotel under another false name. Then, while being careful to leave no trail, he begins looking into the murder. This involves interviewing several witnesses and breaking into the murdered man's office to look for evidence--it really does feel very much like a private eye story. But it works and, within the context of a hard-boiled universe, Corning's actions make sense. Soon, he has enough evidence to convince him that the corrupt cop he ran into in the previous story is the real killer. But to get legal proof, he'll need to convince one of the few honest cops in the city to help him set up a trap. Like pretty much all of Gardner's yarns, "The Top Comes Off" is a well-paced story with a good plot and a satisfying resolution. Once again, the high muckity-mucks in the city government are still free, but Corning is chipping away at their organization. I also enjoy the interplay between Corning and Helen. As I mentioned in my last Corning review, she's a little more extroverted than was Della Street. Also, Corning and Helen are a little more regularly overt in their attraction to each other than Perry and Della usually were. Where Della was adamant that Perry needed her more as a secretary than a wife, Helen gives the impression she would jump to the altar with Ken pretty much any time. But Gardner is too good a storyteller to waste too much time on romantic mush--he keeps the repartee between Corning and Helen fast and witty and keeps our concentration focused on the murder mystery. This is wise. Murder is always more interesting than marriage. How did Dinosaurs end up in World War II? It's my understanding that writer Bob Kanigher and artist Ross Andru considered the first "War That Time Forgot" story to be a one-shot. That is bizarre. It is simply beyond me that they could look at what they produced and not instantly realize that it would be a concept beloved by comic book geeks for generations to come. Take a look at Andru's cover image above. Is it possible NOT to love that? 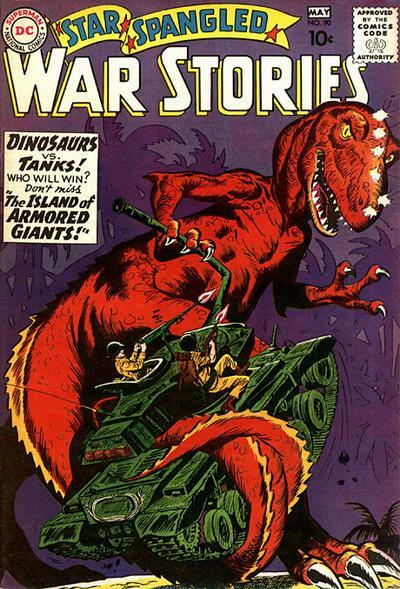 "The Island of Armored Giants" appeared in Star Spangled War Stories #90 (April/May 1960). A squad of Marine raiders is going to parachute onto a Pacific island to find out why the previous two patrols (which were landed on the island by sub) vanished. 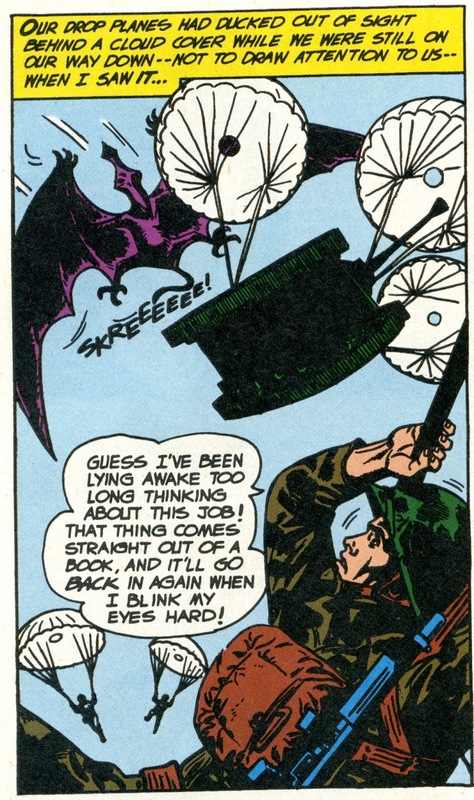 It's not long before the Marines find out what the problem is--they get attacked by a pterodactyl right after they bail out of their planes. The tank that's dropping with them is lost and only six men in the patrol make it down alive. They find lots of Japanese equipment on the island, but not a single Japanese. When a dinosaur rises up out of a cleft in the ground, the ranking Marine instantly deduces that prehistoric creatures have been woken from suspended animation by an earthquake. He is, after all, a corporal, so he knows about stuff like that. 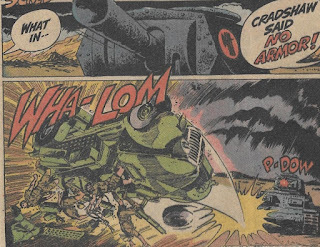 The Marines use an abandoned Japanese tank to kill the dinosaur, but three of them are killed when it collapses on the tank. 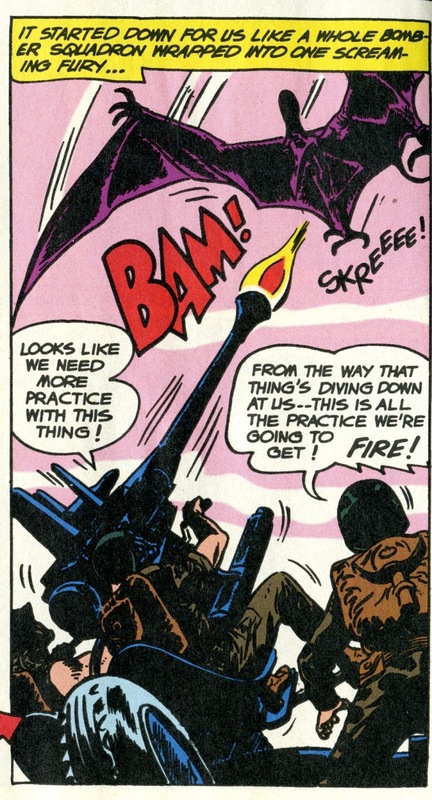 The surviving three of them man an AA gun to take out another pterodactyl, but one of them is killed in that battle. This is a simple and effective way to generate suspense--the small squad is getting gradually whittled down while trying to escape the island. 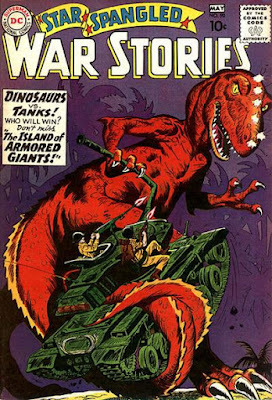 That, combined with the pure awesomeness of watching World War II soldiers battle dinosaurs, is what makes this story work so well. The surviving two men swim out towards the sub that was stationed nearby the pick them up. But the sub is attacked by a sea monster. It's up to the two marines to figure out a way to save the sub so they can also save themselves. The Question Mark patrol would return a few issues later in a story that picks up where this one ends. The War That Time Forgot would soon be a regular feature in Star Spangled War Stories. 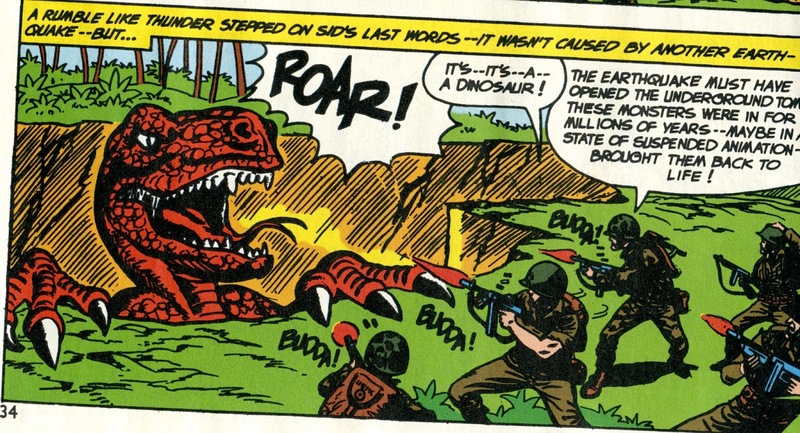 The series never worried that much about continuity, so every single soldier or sailor who encountered dinosaurs would be surprised by their existence. An early story also had Dinosaur Island wiped out by a barrage from the U.S. fleet. But dinosaurs kept popping up, usually in the Pacific but with a few unfrozen dinosaurs in the arctic interfering with attempts to blow up German rocket or U-boat bases. So, if we assume the same continuity for all the stories (and why would we not do so? ), then there are several islands in the Pacific and a few other isolated locations on which dinosaurs still exist. Of course, we all know this is true from the 1933 documentary King Kong and Edward Malone's memoirs about the Challenger expedition to South America, so this doesn't surprise us. But we must be critical of the Allied High Command. 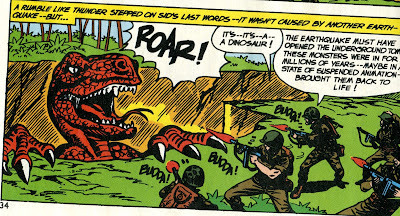 They kept the dinosaurs such a secret, that the poor guys on the front lines kept running into them unexpectedly. I thought better of Nimitz and MacArthur. I really did. Next week, Superman has a rather confusing day. 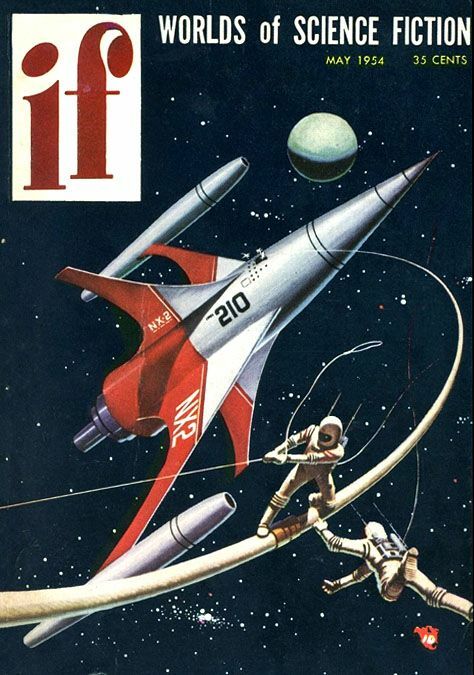 A typically excellent Walter Baumhofer cover. A man taking a trip on the Orient Express becomes entangled in an espionage plot. 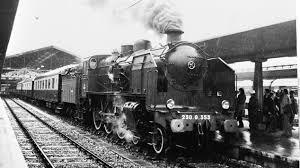 This sort of thing seems to happen on the Orient Express quite frequently, doesn't it? When I was maybe 11 years old, I found a book about PT boats in the public library. It was a young adult novel whose title I forgot, but years later I could still remember certain key elements about it. I do remember thoroughly enjoying it. For a long time, I was unable to identify the book again. I didn't remember title, author or enough of the plot to narrow it down. Also, it turns out, that I had actually read two different young adult novels set aboard a PT boat. In my memory, I was combining elements of both these novels into one non-existent book, making my quest that much harder. I discovered this a few years ago, when I found a copy of Torpedo Run on Iron Bottomed Bay, by John Clagett. This was definitely one I read as a kid, but it didn't include one of the characters I remembered. It was then I realized I was indeed remembering two separate books. Gee whiz, I thought I had fulfilled my quest but was only half-way there. 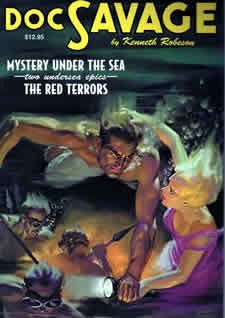 Recently, I tried again and found a copy of Torpedo Run, by Robb White (1962). It is not the second PT boat novel from my childhood. But it turned out to be quite good and was well worth reading. The main character is Peter Brent, the second-in-command of a PT boat nicknamed Slewfoot by the crew. When the book opens, Peter and the crew are burying their captain, who had been killed on the last mission. He'd been a good captain and Slewfoot had built up an impressive record in attacking Japanese ships and barges trying to sneak reinforcements into New Guinea each night. So the loss of their commander is a serious blow. The crew, though, is confident that Peter will also be a good commander. The next night, they at first think they might be badly mistaken when Peter seems to be reluctant to attack some Japanese transports. But Peter suspected a trap--guessing that some destroyers were hiding behind the transports, using the bulk of the larger ships to hide both visually and from radar. He's right and is thus able to maneuver Slewfoot for an attack on the destroyers. 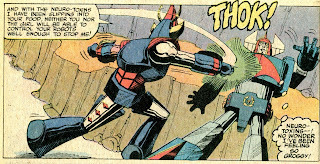 These leads to the first of several superbly described action scenes. But Slewfoot will not remain a happy boat. Peter isn't allowed to permanently take command. A brand-new and completely inexperienced officer named Adrian Archer is given that post. Archer is a spit-and-polish disciplinarian who quickly alienates the crew. By itself, enforcing strict military discipline is usually a good thing in a military unit, so I was at first curious to see what direction the book took with this. In fact, it had been established that the crew had become a little lax in some of the maintenance needed to keep the boat in prime condition. But Peter makes an effective argument that a small unit (the crew numbers just a dozen men) in an isolated post has to have a more relaxed manner of doing things and he seems to be right. Archer's leadership style damages morale in a very real way. But his views on discipline aren't the only thing that makes Archer unpopular. He's also stubborn and unwilling to learn, making several decisions while Slewfoot is at sea that endanger the boat and the crew. Soon, several of the crew are openly considering defying Archer, while others shy away from this. Peter, as an officer, can't openly take the crew's side even when he thinks Archer is wrong. Soon, a crew that worked together so well is about to come apart at the seams. One dark night, when Archer refuses to open fire on Japanese barge because it hasn't been clearly identified yet, the barge has a chance to shoot first. A crewman is seriously wounded and the Slewfoot's engines are wrecked. Now they are drifting towards the Philippines, which are 2000 miles away and occupied by the Japanese. Archer, though, still makes decisions that tick off the crew and put them in greater danger. Peter finally reaches a point where he feels he has to step forward and take command. But Archer might have depth to him that the others haven't recognized. Torpedo Run is a great war story filled with three-dimensional characters. As a young adult novel, the violence is never described in an overtly graphic manner and the characters don't use some of the saltier language that sailors commonly used in real life. But that's fine. Robb White gives us guys we accept as real and who all believably act and react according to their own personalities. The book never uses its status as a young adult novel to shy away from difficult subjects. Is the crew right to consider mutiny? Is Archer right to enforce strict military discipline, even if he is clearly wrong in his combat decisions? Was a crewman right to fire back at an American bomber that mistook them for Japanese and attacked them? The last 50 or so pages of the book, with the exhausted crew trying to tow Slewfoot into the path of an island (using a rubber raft and oars) and then dealing with a possible attack from local cannibals, is real edge-of-your-seat stuff. So I'm glad I read this book. But it's still not the as-yet unidentified PT boat novel from my childhood. BUT--with the help of several people on a Goodreads forum dedicated to just such things--I may have found the this book at last. As of my writing this post (about 5 weeks before it posts), the latest suspect is being shipped to me from a used book store in Oregon. 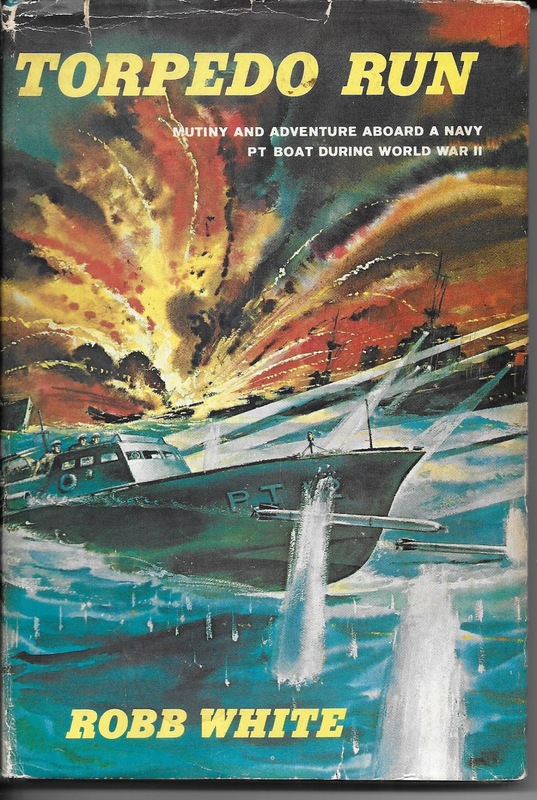 If it is the book I read as a kid, I may do a two-part series on "PT Boats from my Childhood," covering both that book and the John Clagett novel mentioned above. One can never have too many PT Boats in one's life. 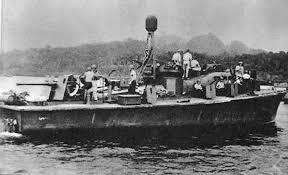 PT boats are cool.